Upgrade to three or four separate smart displays is available. 10 to 12 hours. The battery recharges from the one A/C adapter, or the 3 scales can run from the A/C with or without the battery. This Box contains 3 stand-alone scales. 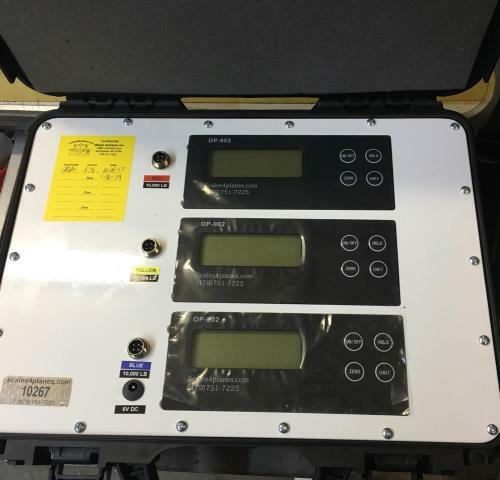 All calibration is stored inside this protected case. The base units contain the load cell only and are therefore very rugged and ship very well. Pictured is the optional White Finish, or you can purchase our Standard Brushed Aluminum Finish. Read data from up to 3 smart scales. They contain no calibration data, and therefore would not need to be returned during routine Annual Calibration. The Nanook Case provides superior Protection. A/C adapter to power up the scales is included. All remotes on this page are covered by our limited 12 month warranty.